Covalence presents a beautifully designed Stemmed Dessert Dish. It looks like glass, but is plastic. Have an eloquent presentation, but don’t worry about broken glass, or carefully cleaning. Just use, then dispose of after the event. 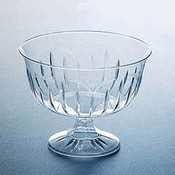 Like all Covalence products the Stemmed Dessert Dish is a quality made product. It is safe, and sanitary, perfect to put your serving worries to rest. Use the Stemmed Dessert Dish alone, or as the finale to a five course meal. The Stemmed Dessert Dish comes packed 120 to a case. For your next event, order several cases of the dessert dish from Reliable Paper, for your next event.